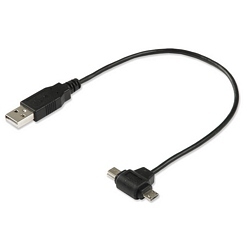 Pros: Provides both Micro-USB & Mini-USB connections. Other Thoughts: I love this doodad. I keep one connected to my desktop. Kindle takes Micro but Sony eReader uses Mini. I travel with another one to charge my phone and my Sony eReader.